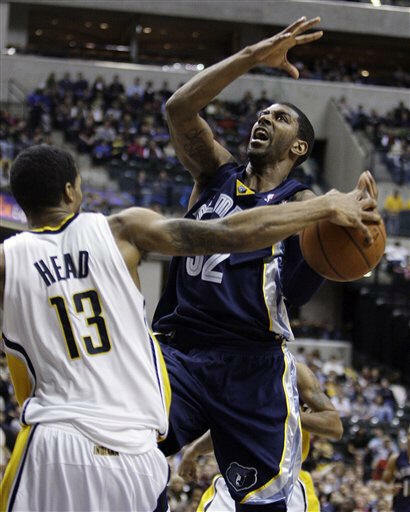 [December 31, 2009] INDIANAPOLIS (AP) -- Rudy Gay scored 31 points to lead the Memphis Grizzlies over Indiana 121-110 on Wednesday night, the Pacers' eighth straight loss. Zach Randolph had 28 points and 13 rebounds, and Marc Gasol added 21 points and 10 boards for the Grizzlies. Former Pacer Jamaal Tinsley scored three points in 15 minutes for Memphis. It was his first game in Indiana since the Pacers waived him this past summer. Tinsley often found himself injured or in legal trouble during his stay, and Pacers fans who remembered showered him with boos when he entered the game late in the first quarter. Luther Head tied a career high with 30 points, including 15 in the fourth quarter, and Roy Hibbert added a career-best 25 points and 13 rebounds for the short-handed Pacers. Tinsley started his pro career with Indiana in 2001 and remained with the Pacers until July. He left the franchise with career averages of 10.4 points and 7.0 assists. 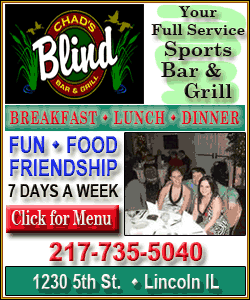 The Pacers told him not to report to training camp last season and did not allow him to play. The NBA players' union filed a grievance for him in February, but the arbitration hearing was canceled when the Pacers waived him. Tinsley shook off the crowd's response and made his first shot, a 3-pointer that got a friendly bounce with 10 minutes left in the second quarter. It was the only field goal he made. Memphis led 68-51 at halftime and extended its lead to 20 points before the Pacers cut their deficit to 84-70 in the third quarter. 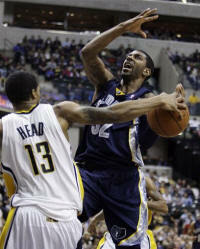 The Grizzlies regrouped and led 93-79 at the end of the period, despite Hibbert's 12-point quarter. Head made back-to-back 3-pointers to cut Memphis' lead to 111-101 with just over 4 minutes to play, but the Pacers never trimmed their deficit below 10 points. Memphis shot 51 percent from the field and outscored the Pacers 29-17 from the free throw line. Indiana's Troy Murphy sat out after spraining his left ankle Tuesday against Chicago, and his return date is uncertain. Tyler Hansbrough, a rookie who has been one of the team's top reserves, sat out with an inner ear infection. NOTES: The Pacers shot 62 percent in the first quarter and still trailed 35-29 at the end of the period. ... The Pacers had only 10 available players. ... Pacers F Solomon Jones scored four points in 13 minutes in his second start. ... Indianapolis native Mike Conley had 13 points and seven assists for the Grizzlies. ... Memphis improved to 13-7 when Tinsley plays.